After 20 years of marriage, longtime actor and president of the He-Man Donald Trump Haters Club, is set to divorce his wife of 20 years, Grace Hightower. A source tells People Magazine the couple, parents to 20-year-old son Elliot and 6-year-old daughter Helen, has already separated and begun living apart. “Sometimes things don’t work out the way you hope or want them to,” the source said. Hightower met De Niro at Mr. Chow’s in London in the late eighties, where she was working as a hostess. Hightower, now known for her charity work, dated De Niro for a decade before their marriage in 1997. This isn’t the couple’s first foray into separation: De Niro filed for divorce in 1999, which kicked off a contentious custody battle, before ultimately reconciling in 2004 with a vow renewal featuring a who’s who of Hollywood contemporaries. The two were last seen together at the 72nd annual Tony Awards in New York City. 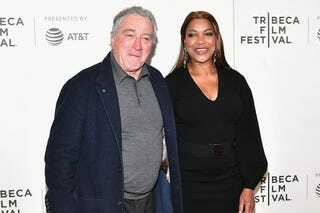 The famously private, family-oriented De Niro, has yet to publicly comment on the status of his marriage. The couple has bounced back from a long-standing and messy separation before, and here’s hoping they’ll hammer out their issues again, should they both desire reconciliation. We’ll keep you up to date either way.